This shoot took place in my mother’s homeland, the Philippines. While there, I knew I had to take advantage of my time and document all that I could, because I was experiencing a part of my culture that I didn’t have access to. I had been to the Philippines before when I was a lot younger, but only now, at the age of 25, did I truly understand the importance of my ethnicity in regards to my identity. While in Manila, I was lucky enough to meet up with sustainable fashion lover and content creator, Bea Llagas, otherwise known as Style Siren on YouTube. Her channel introduced me to thrifting in the Philippines, otherwise known as “ukay-ukay”, derived from the Tagalog verb halukay, which means "to dig" or "to sift through”. It was exciting to discover this vibrant thrift scene in a place tied so closely to who I am. This shoot was by far the most fast-paced I had ever done —a total of 30 minutes. By this point in my trip, I had used up all my film and was down to the last roll. 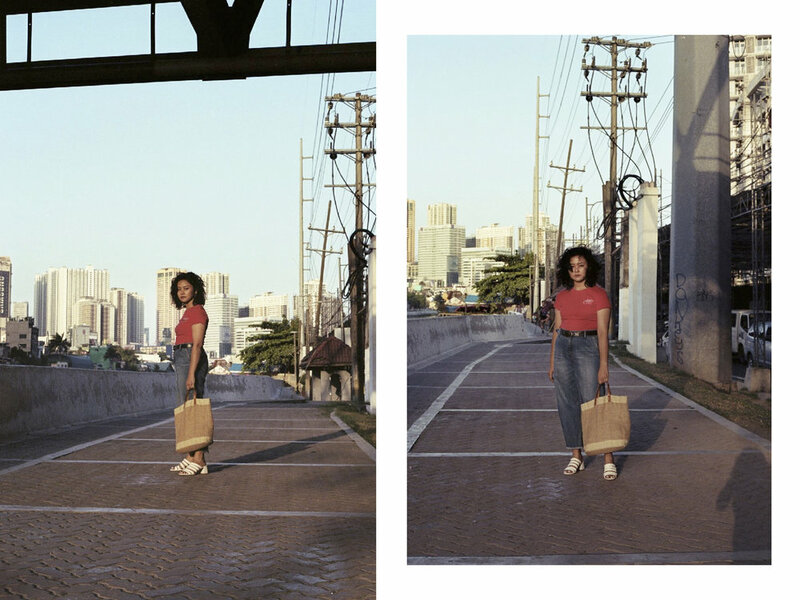 I decided to photograph Bea in a location between Pasig River and Metro Manila, which acts as a border line between the poorer neighborhoods and the very upscale metropolitan area in Manila. Although our meeting was short-lived, we spent the remaining time talking and getting to know each other —finding similarities and differences in our experiences as Filipinas in different geopolitical environments. Jaymee is a film photographer based in the San Francisco Bay Area. Her work consists of portraits, still-life, editorial, and experimental darkroom processes.